A mad rush to book world’s cheapest smartphone Freedom 251, caused the firm’s website server crash, and booking stopped , within hours of opening up for pre-order at 6 am on Thursday. The Noida-based startup received nearly six lakh hits per second to buy the Rs 251 (less than $4) device, the company said in a statement. “Dear friends, we are very grateful for your enormous response and your kind patronage and would submit that as of now we receive approx 6 lakh hits per second, as a result of which due to your kind overwhelming response servers are overloaded,” Ringing Bells Pvt Ltd. flashed a message on www.freedom251.com. “We humbly submit that we are, therefore, taking a pause and upgrading the service and will revert within or before 24 hours,” the message read. 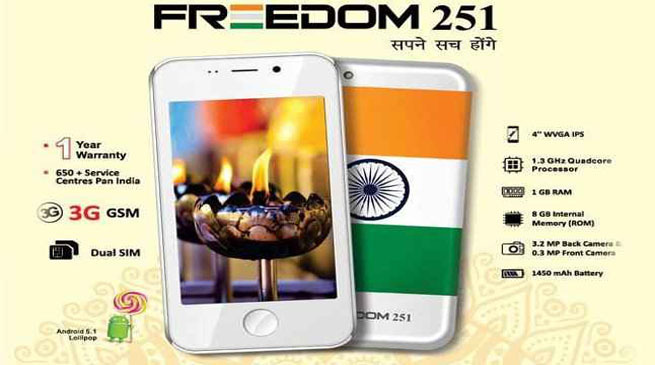 The Indian smart phone manufacturer Ringing Bells has launched the world’s cheapest smart phone Freedom 251 at Rs 251. The smart phone can be purchased from the company’s website freedom251.com starting February 18. But. when people starts booking the world cheapest smart phone, it seems the company’s website is facing glitches. People starts posting their experiences with the company’s sites in social media. Some of those posts are like ” we tried ordering the smart phone twice, but failed both the times”. “While early morning the website of the company was not opening, we tried again around 9am and this time while the website opened, when we clicked on the ‘buy now’ button, a new page opens which asked us to fill all our details. However, as soon as we clicked on ‘pay now’ button, the page refreshes and we are not able to order the smart phone. Freedom 251 features a 4-inch qHD display with 960×540 pixels resolution. The handset is powered by a 1.3GHz quad-core processor and promises to deliver a smooth and lag-free performance. The device offers 1GB of RAM and 8GB of internal storage which can be further expanded up to 32GB using a microSD card. The same RAM and storage capacity combination is often seen in several sub-Rs 5,000 smart phones. For photography, the smart phone consists of a 3.2MP rear camera and a 0.3MP front-facing camera for selfies. There is also flash support for low-light photography. The handset also offers some pre-loaded apps useful for women, farmers, fishermen and general users. It also has social apps like WhatsApp, Facebook, YouTube and you can access the other apps from the Google Play store. Freedom 251 houses a 1,450mAh battery, which the company claims will last a day on single charge. The smart phone comes with a 1-year warranty. Ringing Bells has 650 service centers across the country. The company has launched the smart phone as a part of the Indian government’s Make In India initiative.